Who needs an accurate flavor description when you can just call them “BLAZE”? Doritos, one of the few brands who never shies away from X-TREME branding, has released BLAZE flavor tortilla chips. You know when the bag features “heat signature” hand prints and a chip that’s on fiah, that these things are gonna have some zest. And they do, certainly. The first bite was full of shock and awe as my tongue recoiled by what was an unexpected shot in the mouth of heat. But it felt like when you say you want “one-star” on your Thai food but because of poor phone reception, the person taking your delivery order hears “four-star” and then the first bite of your phad see ew is waaaaaaaay too zesty for a weak spice palate. And I suppose that’s my problem with these chips. It’s not so much that they taste bad, it’s that there’s no way to judge the accuracy of the flavor when the description is so… [insert powerful but yet somehow still non-specific adjective]. Imagine seeing a movie poster with Ryan Gosling and Jennifer Lawrence posing romantically but with weapons in front of an exploding submarine out in the middle of the ocean, the title simply reading “LOVE HUNTER.” You would have absolutely no clue what to expect when trying to see that movie using your MoviePass but then realizing their business model is failing meaning the app doesn’t work once you arrive at the theater, and instead have to pay out-of-pocket which makes the experience a little wonky off-the-bat. That’s kind of what it was like eating Doritos BLAZE. Doritos has a line of spicy flavors, like Spicy Nacho, Poppin’ Jalapeno, and a bunch of other bigger and bolder adjectives. 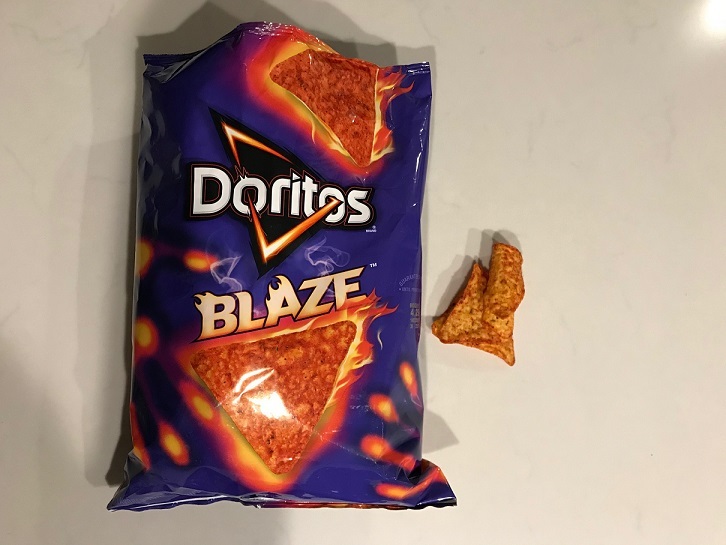 But none of them ever live up to their names, which is fine but has still set an expectation that it’s safe to buy a Doritos “spicy” flavor (or in this case BLAZE flavor), and enjoy a moderately-flavored chip. My heart aches for the person who brought these home in hopes of doing something nice for the family only to overwhelm everyone in the household with a chip that out-kicks the coverage of Doritos’ standard spice profile.